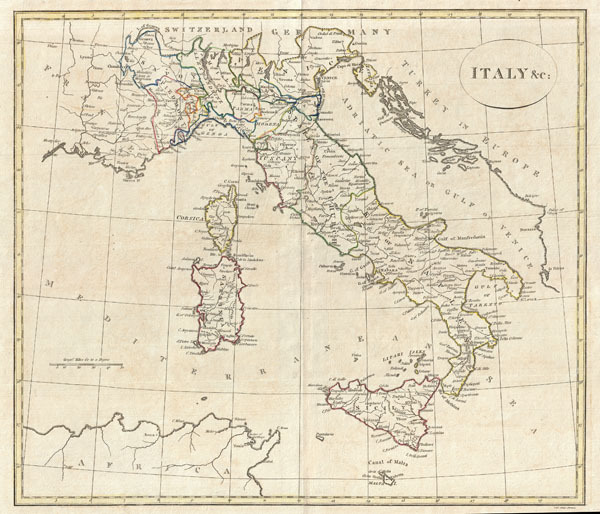 A fine 1799 map of Italy by the English map publisher Clement Cruttwell. Shows the entire country including the islands of Sicily, Sardinia, and Corsica, and Malta. Includes the regions Piedmont, Savoy, Allesandrine, Parma, Venice, Genoa, Modena, Tuscany, the States of the Church, and Naples. At this juncture in time Italy was becoming an important part of the 'European Grand Tour' a period in which foreign, mostly British, aristocrats toured France, Italy and Greece to appreciate their arts, cultures, and monuments. The cities of Venice and Rome were the major attractions for these visiting dignitaries, with Naples, Florence, Turin, Sicily, and Milan growing in popularity over the years. Includes rivers, political boundaries, important cities, ports and gulfs. Mountains and other topographical features shown by profile. Outline color and fine copper plate engraving in the minimalist English style prevalent in the late 18th and early 19th centuries. Drawn by Clement Cruttwell and published in the 1799 Atlas to Cruttwell's Gazetteer. a gentleman whose various literary performances, for labour, extent, and utility, have rarely been equaled, and, when regarded as the productions of an unassisted valetudinarian, have perhaps never been surpassed. Cruttwell was also a known correspondent of George Washington to whom he sent his own translation of the Holy Bible, which Washington kept in his personal library until his death. Cruttwell, C., Atlas to Cruttwell's Gazetteer, 1799. Very good. Original centerfold. Platemark visible. Some offsetting. Moderate overall toning. Blank on verso.